Canvas sizes are: 26 x 36 inches with only 64 in the limited edition. From the earliest days of armed conflict, mankind carried weapons into battle under the power and intimidation of Horseback. Warriors from the all four corners of the globe charged into the face of their enemies with the advantage of height, speed, power. and the thunderous noise of an oncoming cavalry. This painting, “Sword of Thunder,” was commissioned by the Boeing Company to celebrate the delivery of the new Apache Longbow presented to The Royal Saudi Land Forces of Saudi Arabia. The RSLF traces their history back to Bedouin warriors riding into battle on their powerful, beautiful Arabian steeds. 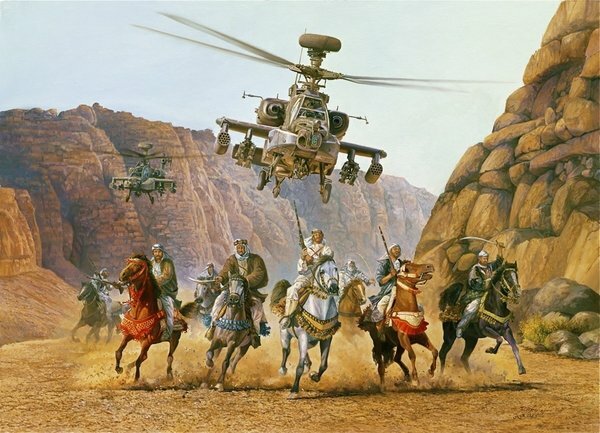 In this painting, Rick captures the power, intimidation, and lethality of the modern helicopter gunship juxtaposed to the warrior history of centuries prior.